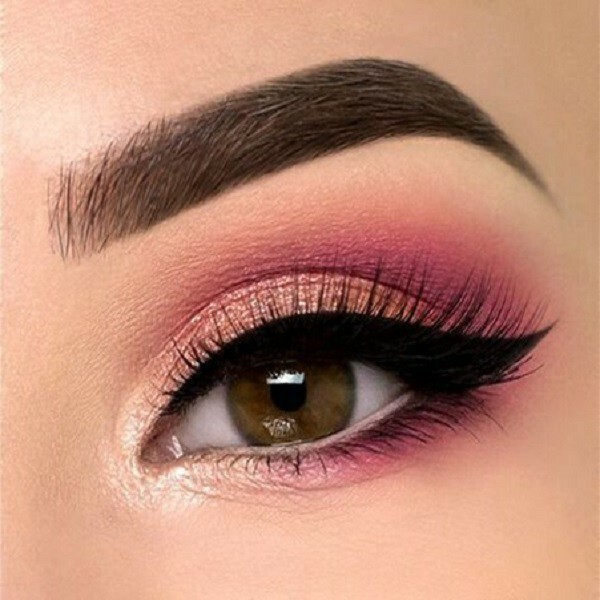 Pink eye makeup has been a favorite for decades and the trend continues to evolve alongside fashion trends, as it often happens with makeup. 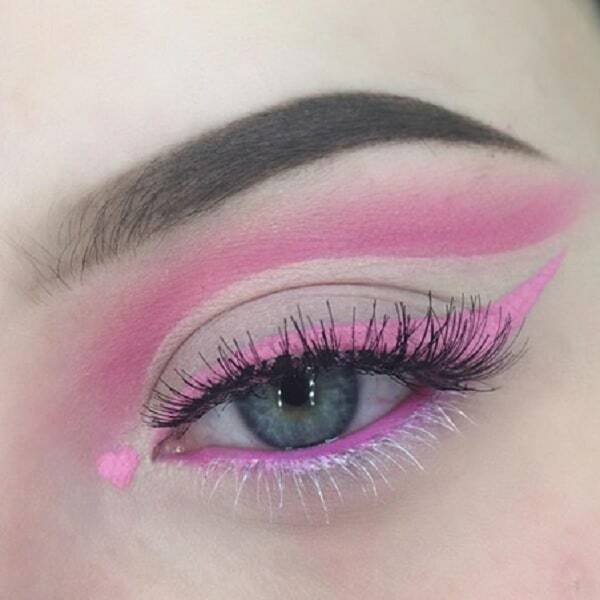 Now, we all have days where we need to have a pop of color on our faces, and in those days, some people can’t think of any other color than pink. 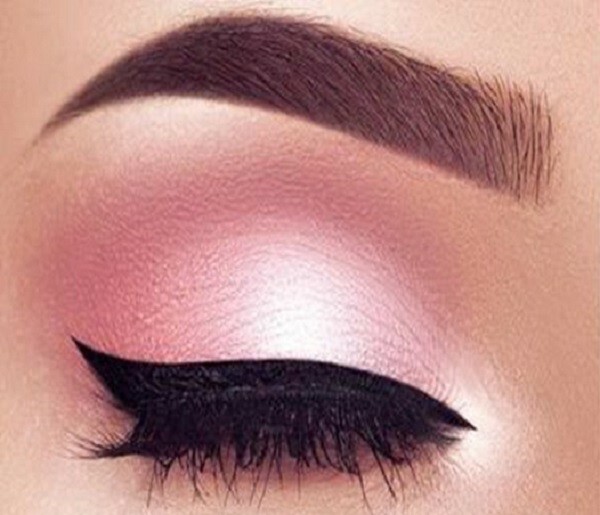 That’s why today we bring you 60 different pink eye makeup looks for you to consider and be inspired. 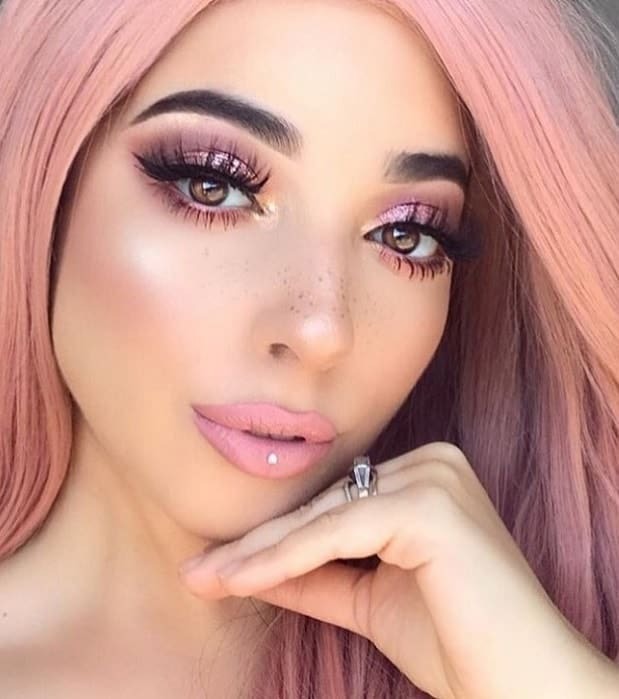 Pink, believe it or not, is a very versatile color and there are many shades available that will allow you to create a new look every time and for any occasion. 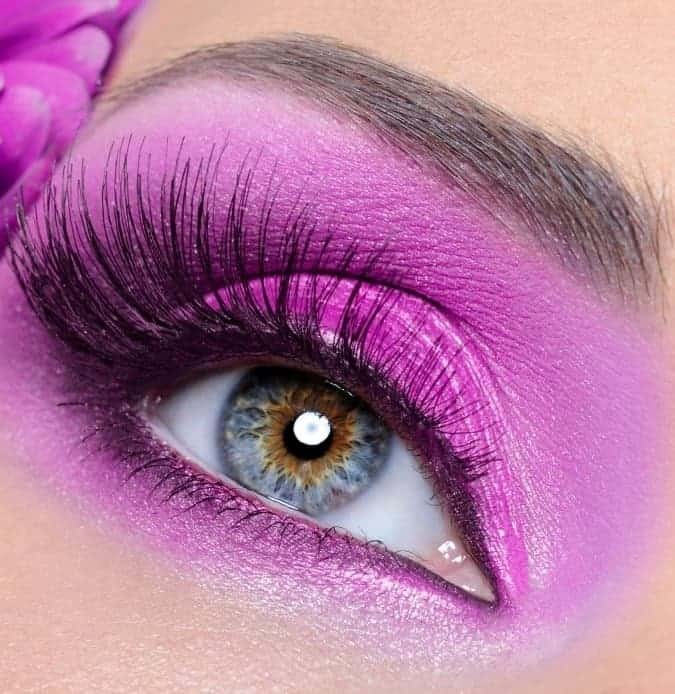 Following are the 45 most beautiful pink eye makeup ideas for women to take inspirations! 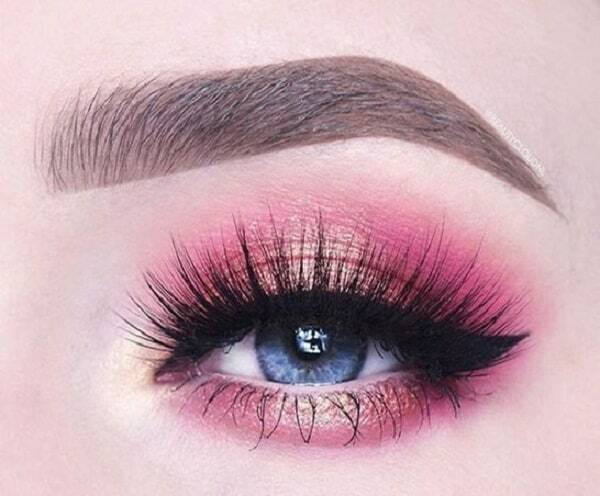 This pink eye makeup is super cute and very subtle. This is something you can pull off on any occasion and it’s simple enough that you can put it together very nicely. If you like to keep it simple, this look is what you’re looking for. 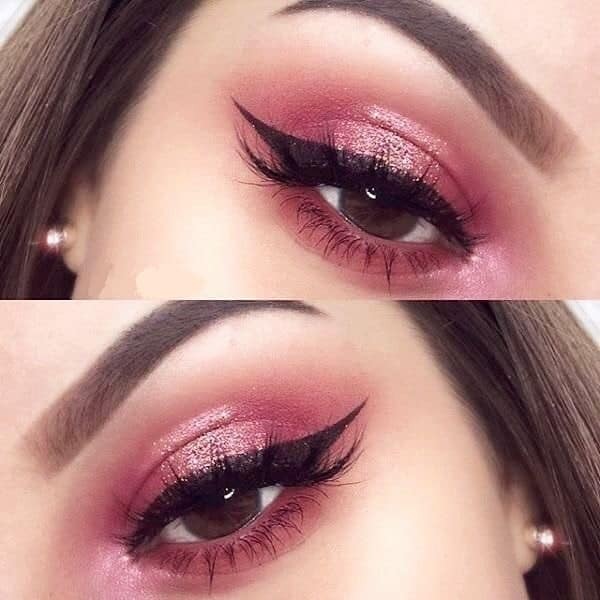 All you need is pink matte eyeshadow and a gorgeous pink metallic eyeliner! If you’re a fan of the 60’s eyeliner look, you can try this version! 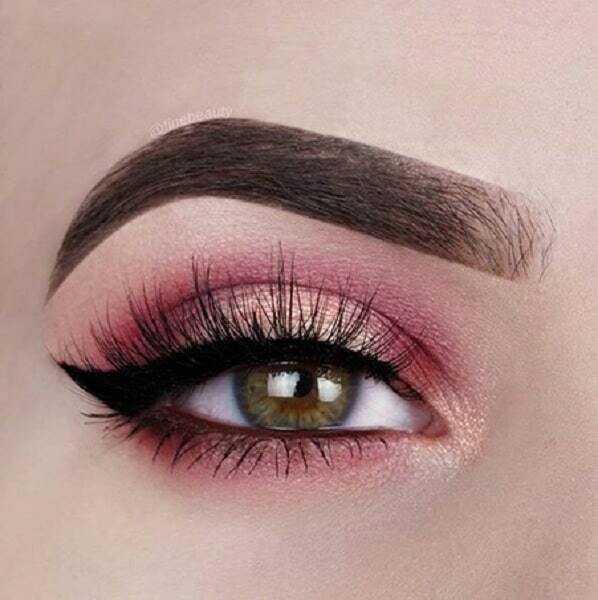 This pink makeup look for eye is easy to put together and it’s also very simple, but it’s definitely interesting. 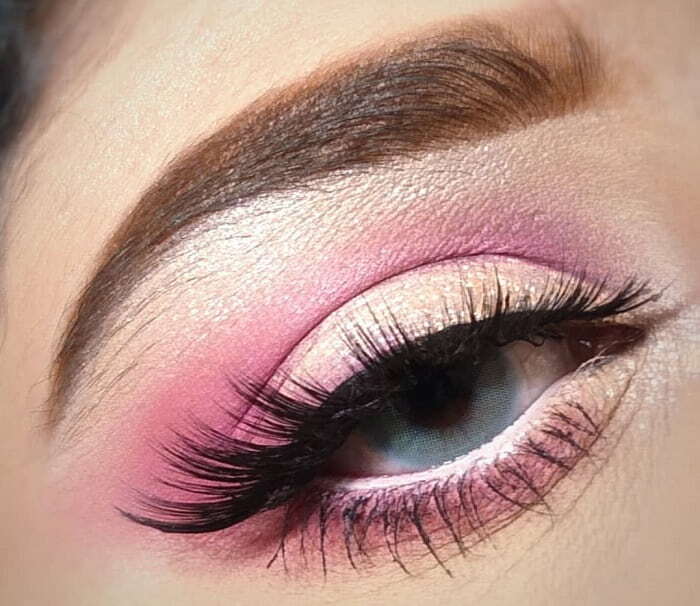 When you combine pink, purple, and baby blue, you get a worthy cotton candy look that you can rock whenever you feel like letting your inner child out and having a bit of fun with your pink eye makeup. If the previous option is too much for you, this subtle version might interest you a bit more. 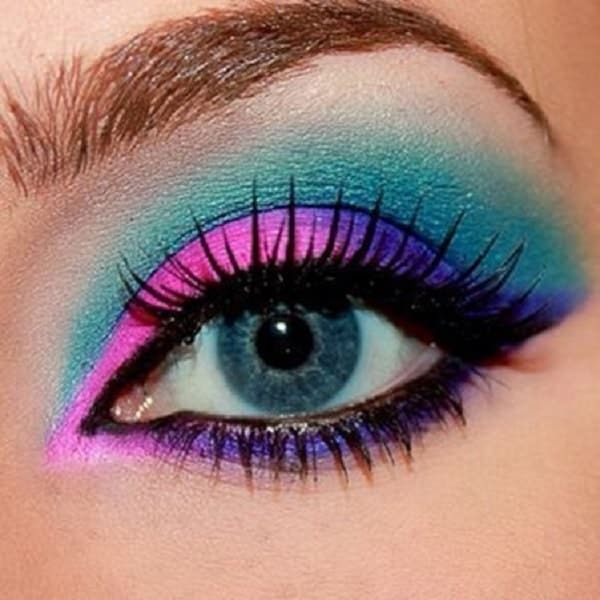 The colors are distributed differently and it makes for a very simple, interesting makeup look with pink eyeshadow. 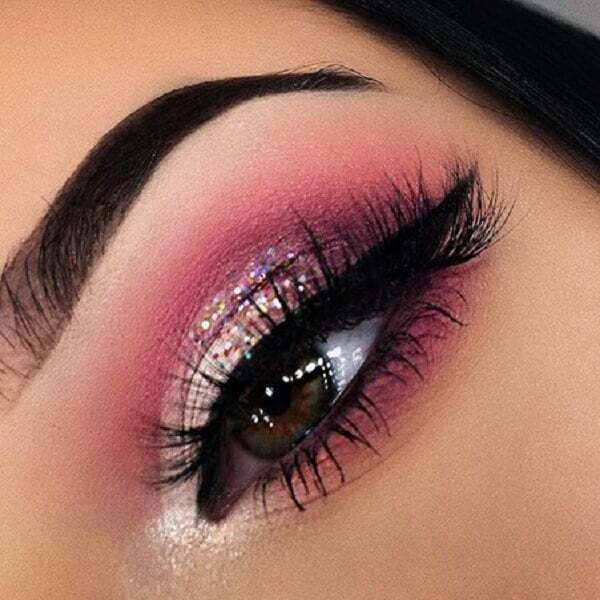 This gorgeous makeup look combines pink matte eyeshadow with a bold black eyeliner and an accent of pink glitter eyeliner at the top that brings it all together. This metallic, glittery look doesn’t need much to add brightness to your face. 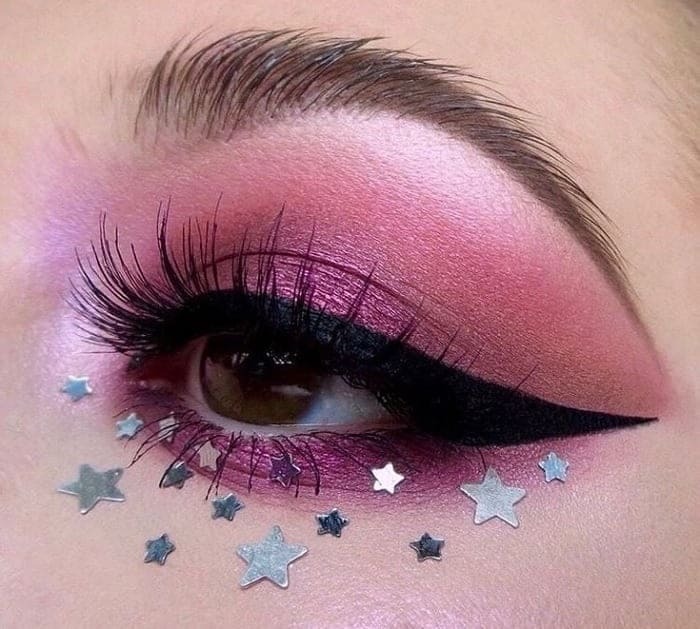 All you need is a glitter baby pink eyeshadow and go for a retro look with the silver glitter eyeliner on the top of the lid. 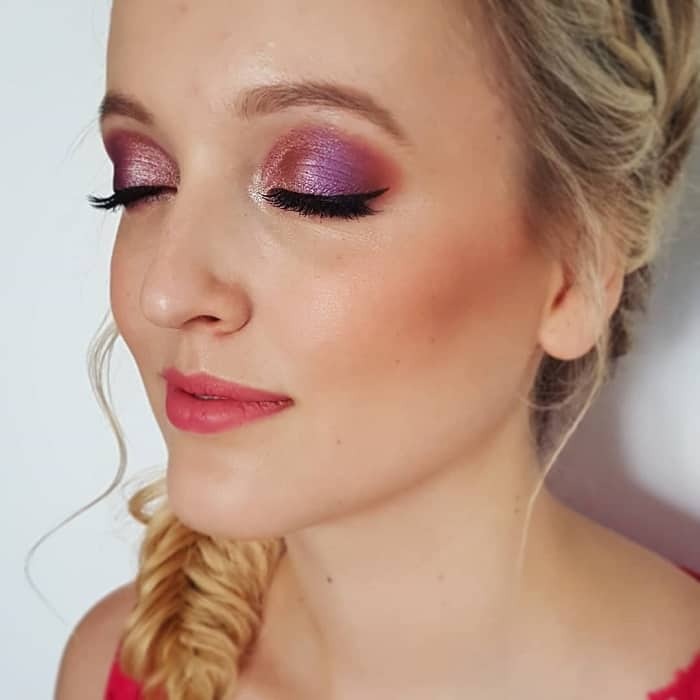 This hot pink eye makeup look is a super colorful option that will help you feel and look bright and bubbly whenever you need. 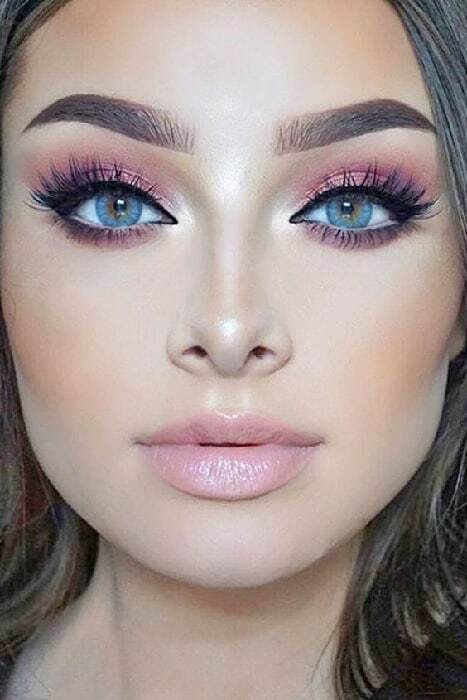 This soft pink eye makeup look is super delicate and subtle, which makes it a perfect option for those days when you need a little break from the natural, neutral eye makeup. 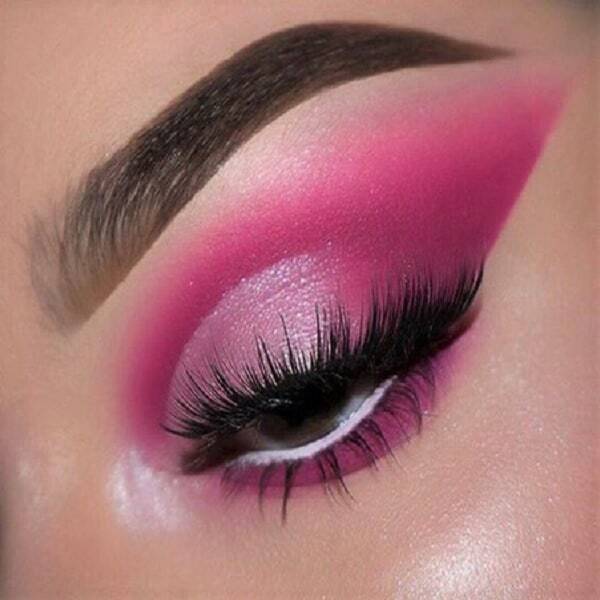 If you want to take your pink makeup look to the extreme, this hot pink look should give you an idea. 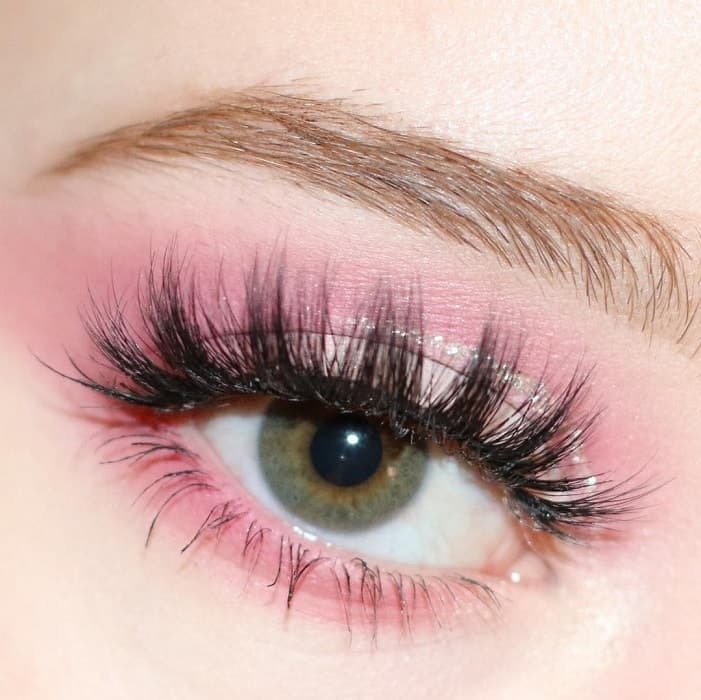 The detail of the hot pink mascara takes it up a notch and it’s definitely something different to try! 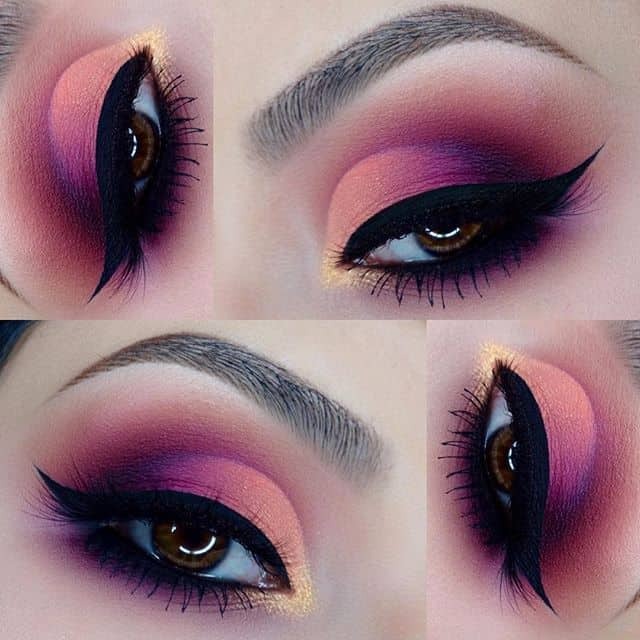 This beautiful look plays with light and vibrant shades of pink to bring brightness to the eyes. Also, the glitter is placed only in the center of the lid, which is a great compromise for people who are not comfortable with it. 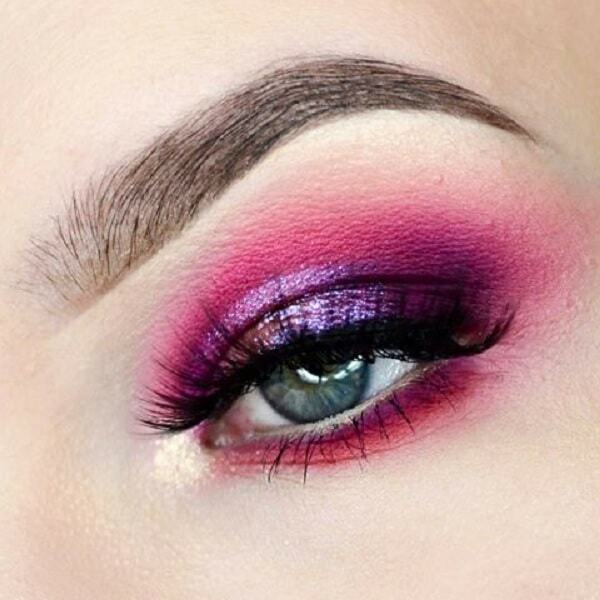 If you like to be bold, this super sharp hot pink eye look will be the option for you! There’s nothing subtle about this, and that’s how we like it! 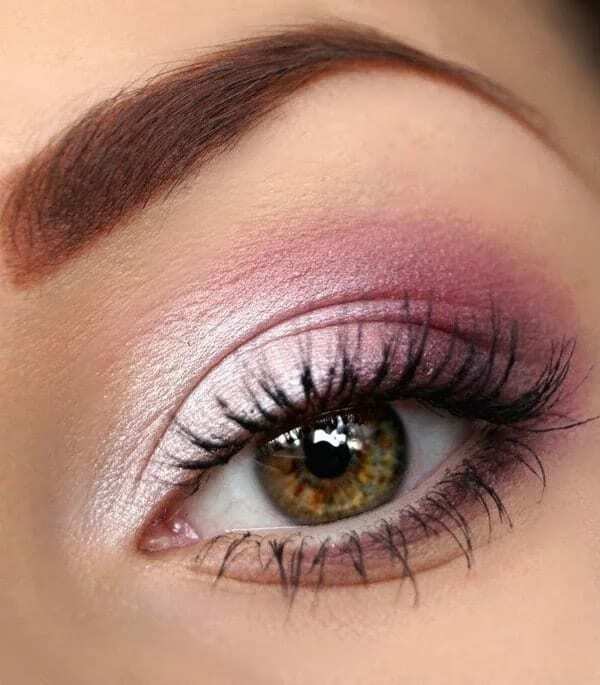 This super soft, sublime pink eye makeup look is definitely something you should try at least once. As you can see, it’s very easy to put together and it doesn’t take much! 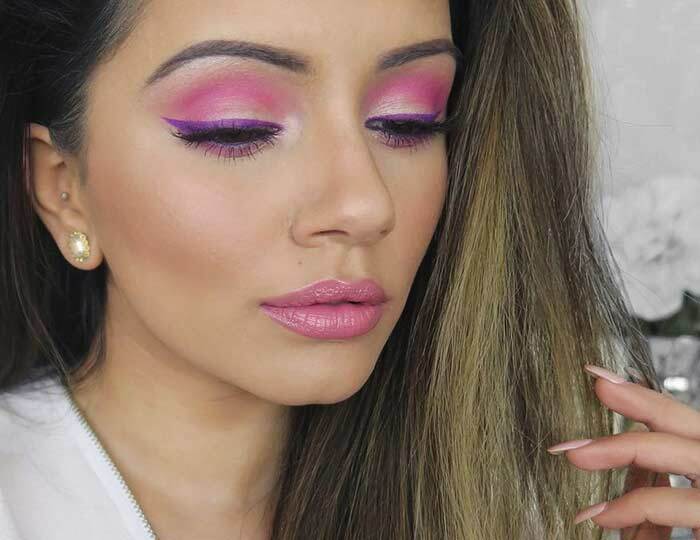 This hot pink look is very different from what we’ve seen so far and it’s incredible. 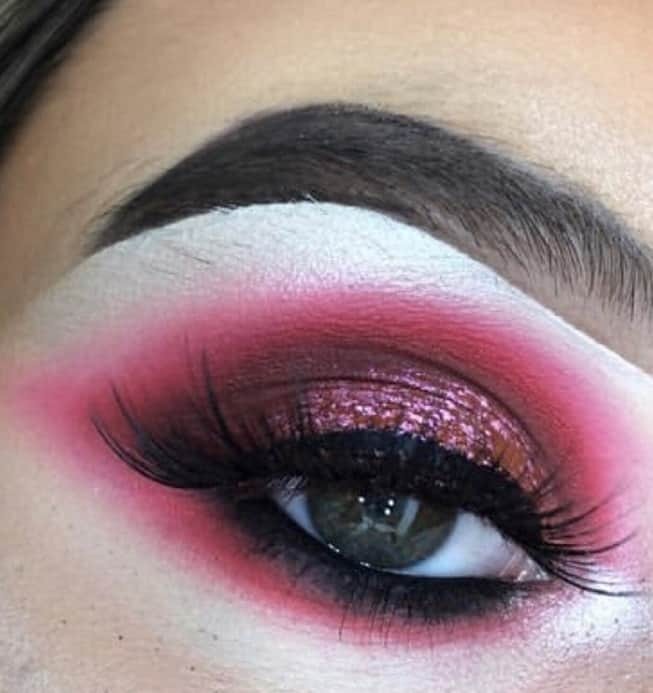 Metallic accents are made on the center of the lid and the inner corner as well, which creates a nice contrast that brings brightness to your eyes. As you can see, there are many different hues of pink at play here and it makes for a very interesting look. Once again, glitter is a part of this look, which is what makes it so interesting and bright. 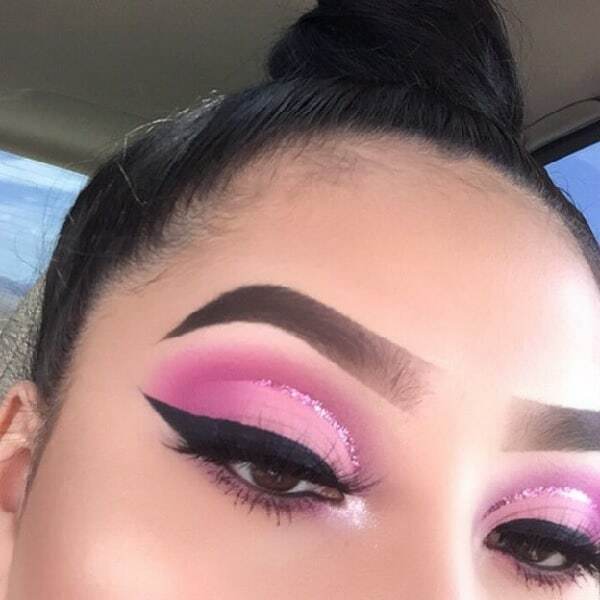 This is yet another way to wear pink makeup with subtlety on a daytime situation. The focus here is mainly on the eyeliner, and the glitter is kept to a minimum so it brings brightness but it’s not overpowering. 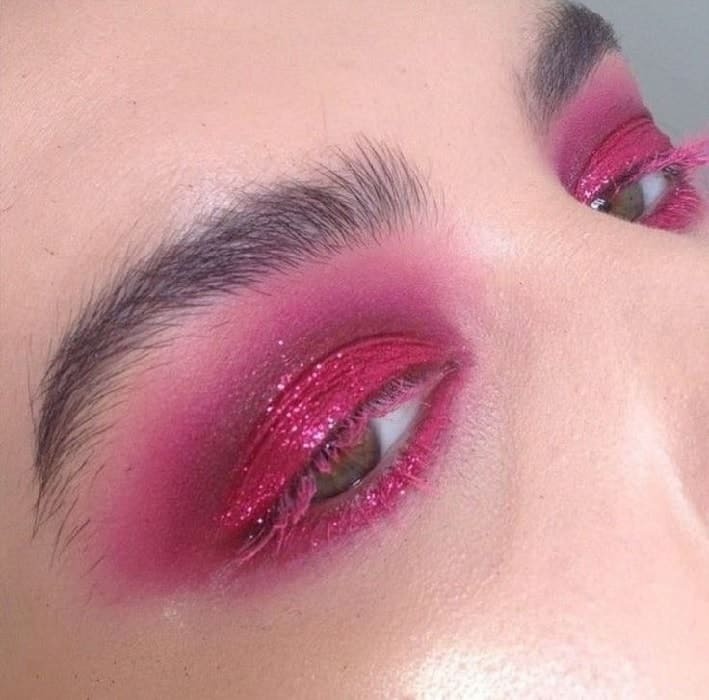 This fluorescent bright pink eye look is very fairy-like, especially because of the glitter accents placed on the inner corner. It’s definitely a fun look! 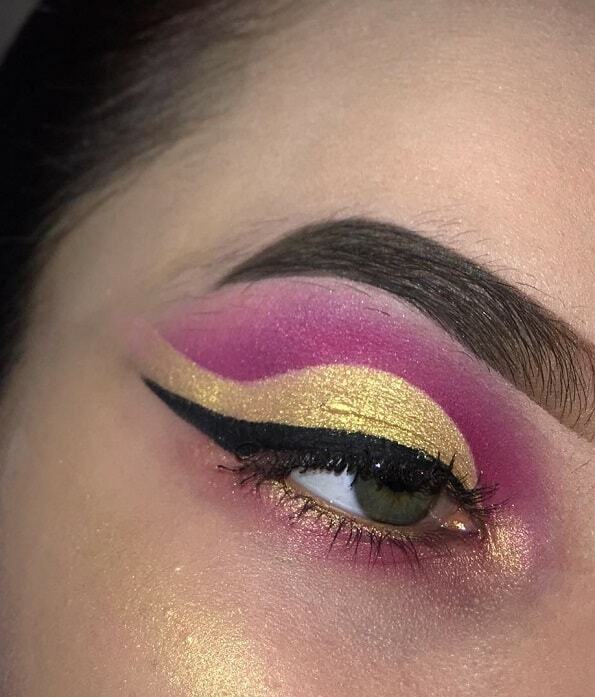 Pink pairs perfectly well with gold, and this look is a perfect example of that! 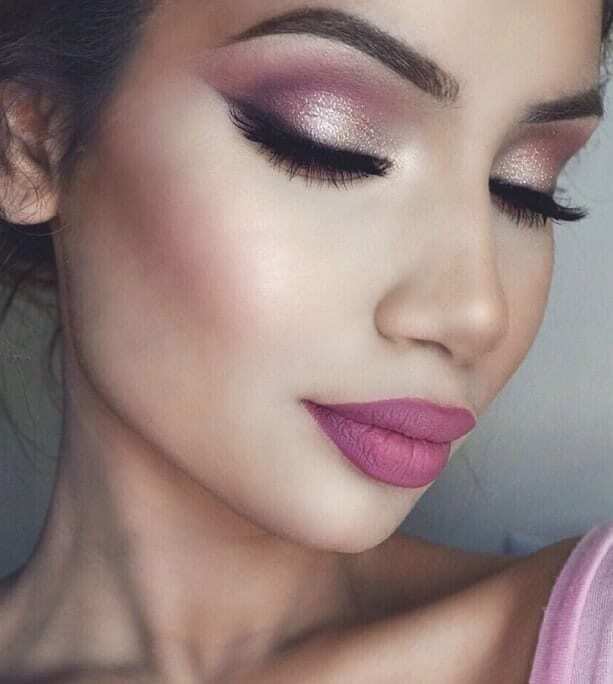 As you can see, it’s very simple and easy to put together, and you can rock this pink makeup on any occasion. 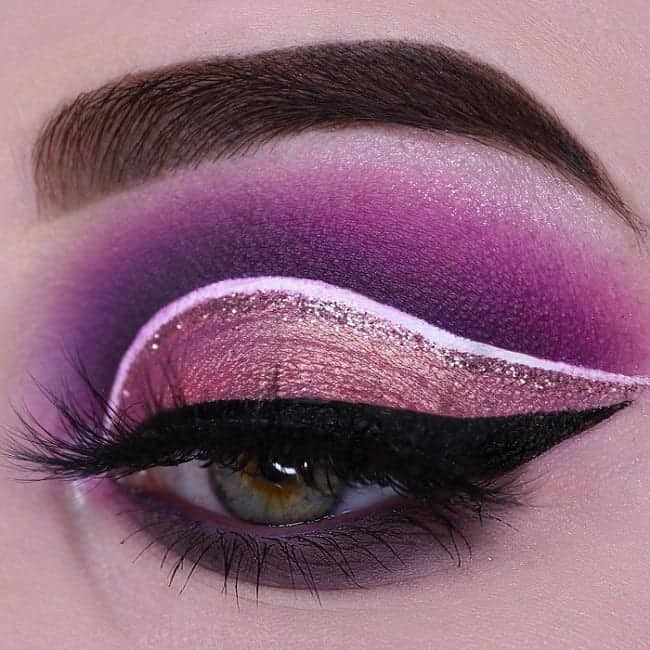 If you like eyeliner, this is a unique way of wearing it you can try either purple or blue eyeliner. You pair it with a subtle, neutral matte pink eyeshadow and a glittery accent on the inner corner for added detail. 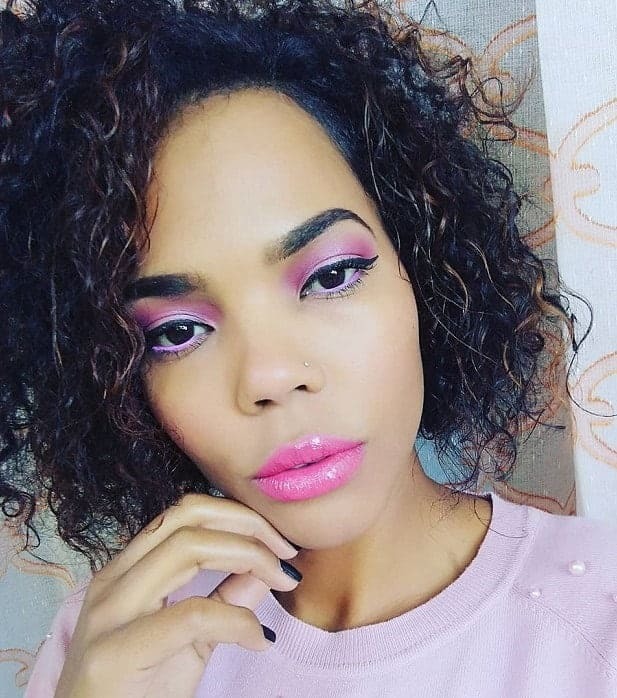 Black and pink is another match made in heaven, and this bold makeup look is a great example. 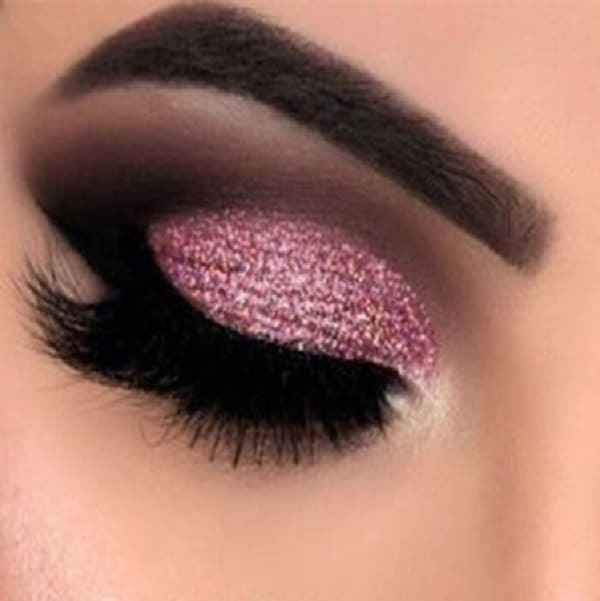 As you can see, pink glitter is used here to bring a lot more complexity to this pink eye makeup look, which you can rock on any evening event. 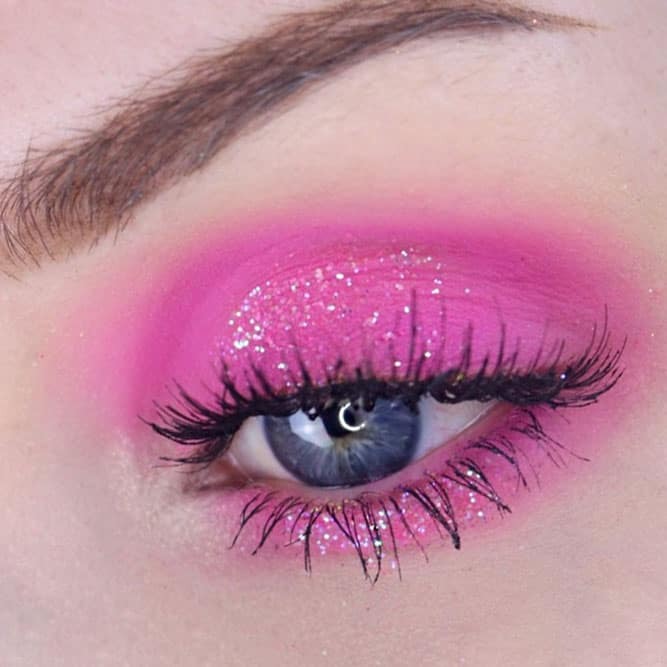 This pink eye look is simple enough and it has just enough glitter to have a bit of brightness but without being overpowering or too bold. This is a look you can rock on any occasion and it’s very easy to put together. This is yet another way to rock the hot pink hues! As you can see, there’s very little eyeliner involved and the matte eyeshadows are the true stars of the show. 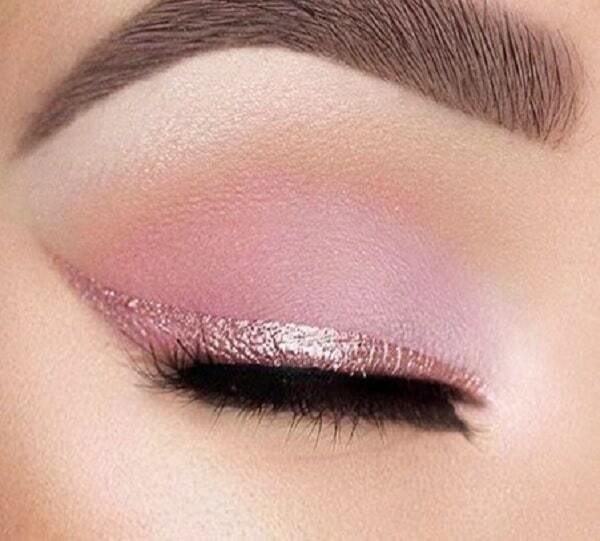 There are different hues of pink here that create an ombre eyeshadow effect that simply looks gorgeous. 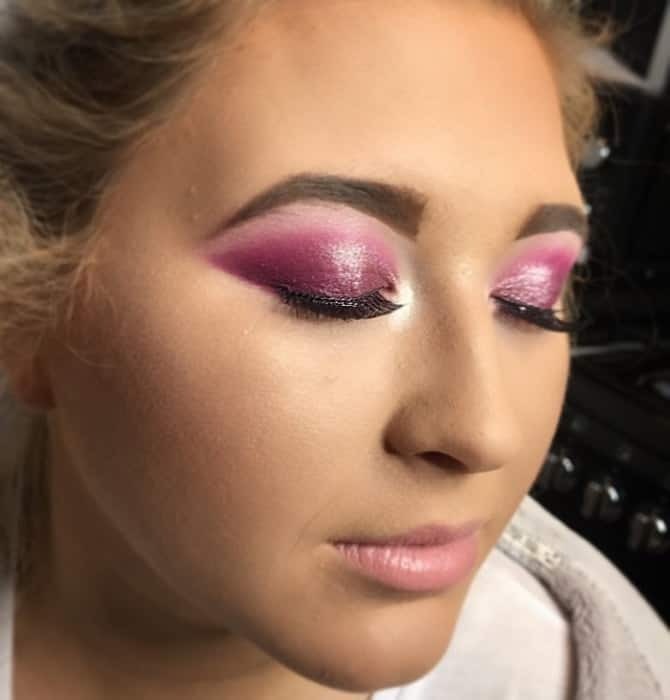 This pink sunset eye makeup is gorgeous and it combines bright barbie pink with a nice orange to provide this super interesting and fun look you can rock whenever you’re feeling bold and happy! 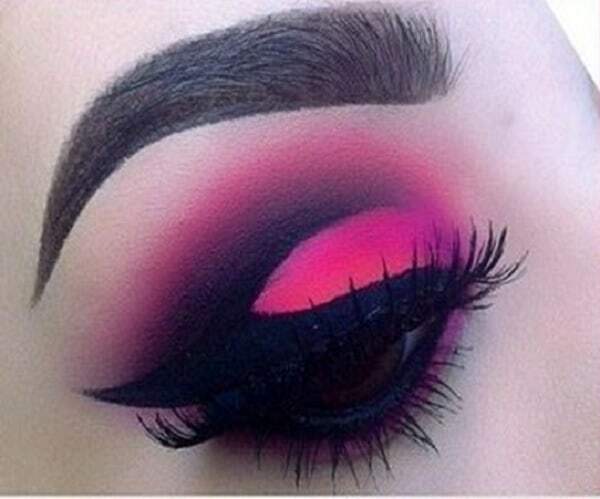 This cool pink eye makeup is another great choice for people who don’t like to wear super bright colors or whose complexion simply won’t allow it. As you can see, there are different hues involved to create a complex look. It’s sleek, elegant, and gorgeous; definitely something you can wear on any occasion. 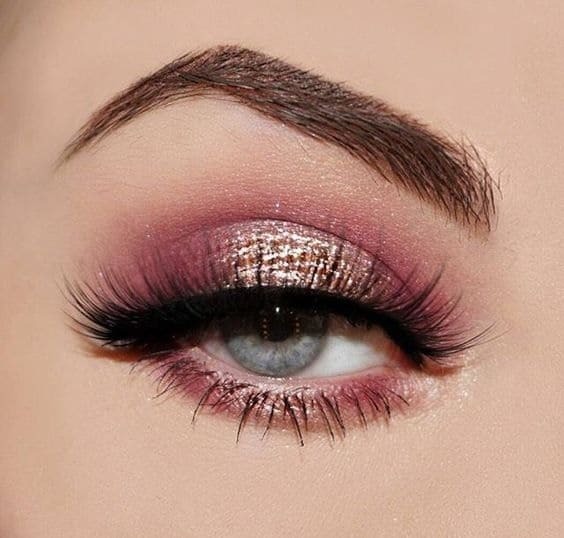 This lovely rose gold eye look is yet another option that’s appropriate for any kind of occasion and it’s also very cool and elegant. If you don’t like bright hot pinks, then this is the right look for you. As you can see, the eyeliner is kept to a minimum and there’s a bit of a smokey effect as well. 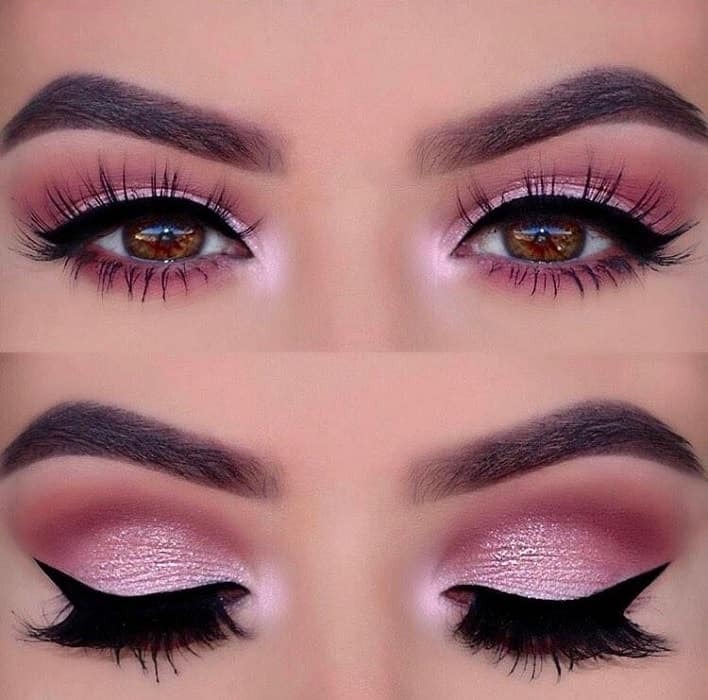 This lovely combination of peach and pink eyeshadowis definitely the right way to go about it! If you’re into experimenting with your makeup and changing it up, this kind of look is exactly what you should try more often. It makes your eyes look bright and warm, and it’s something you can rock on any occasion. If you liked the peach and pink idea, then you’ll love this metallic version as well. 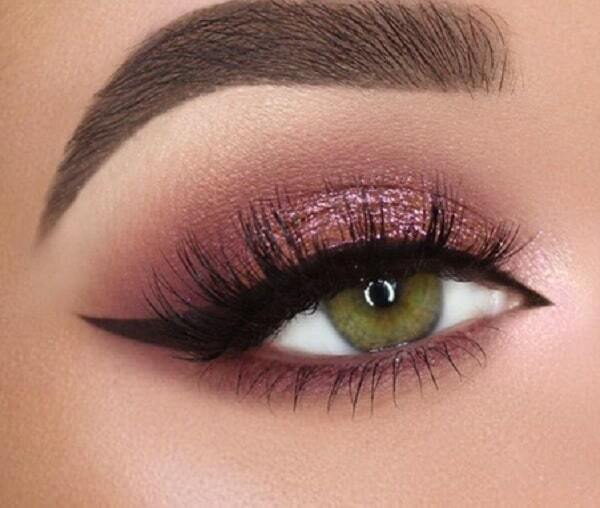 As you can see, this is a very simple pink eye makeup and you won’t need much to put it together. Not to mention the use of metallic eyeshadows brings the focus right to your eyes and it really brightens them up. This is something you can pull off at any occasion as well! 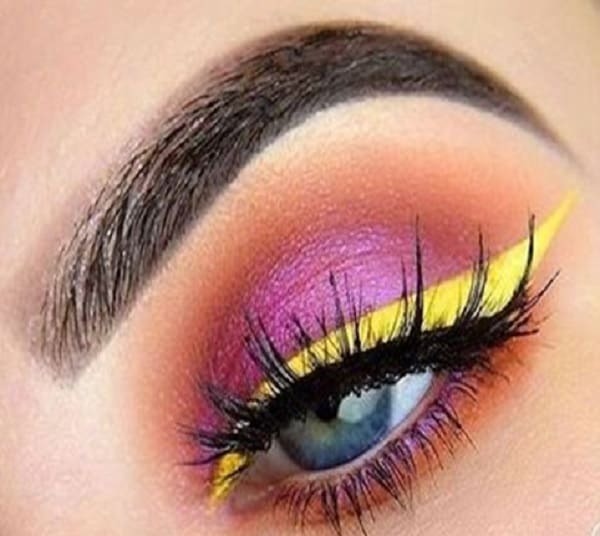 This bright pink eye makeup paired with a bright yellow eyeliner is definitely not for everyone, but it sure is a fun look! As you can see, there’s very little needed to make this look unique and interesting. 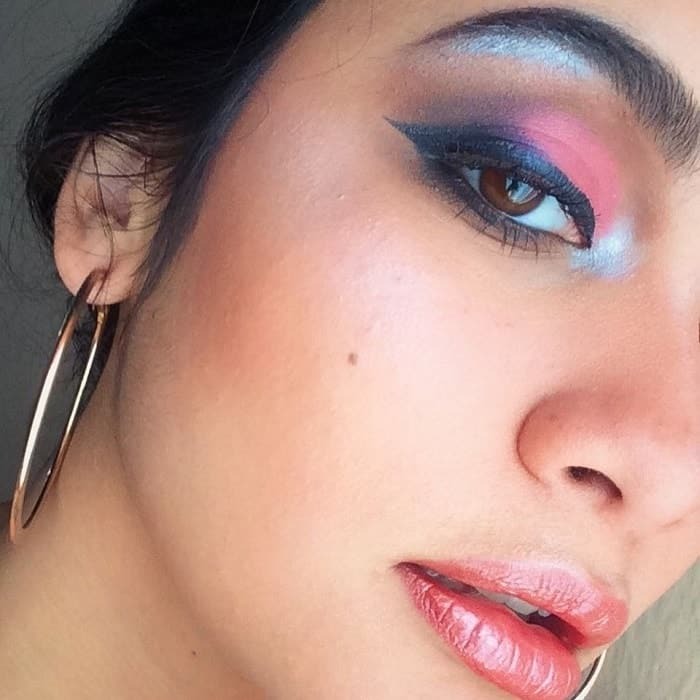 If you like uncommon eye makeup looks, then this is definitely right up your alley! 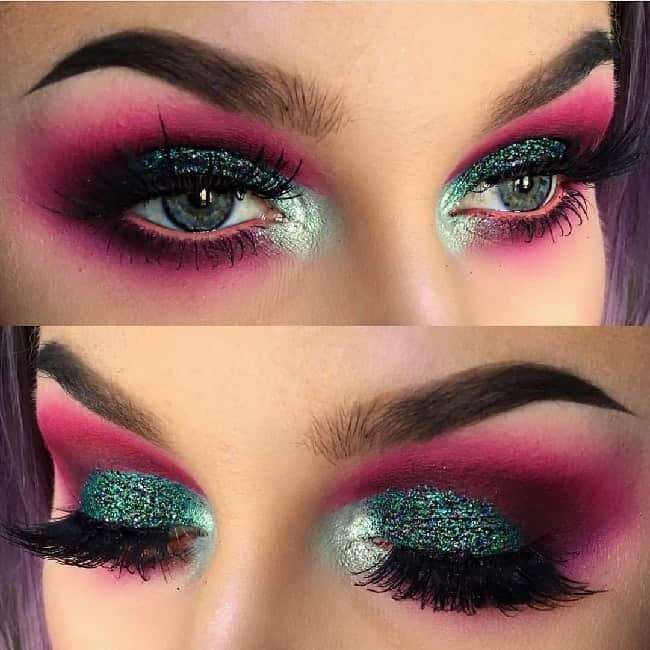 We already saw that black goes very well with baby pink and glitter, but it also goes well with super bright, hot pink matte eyeshadows to give a black smokey eye look. 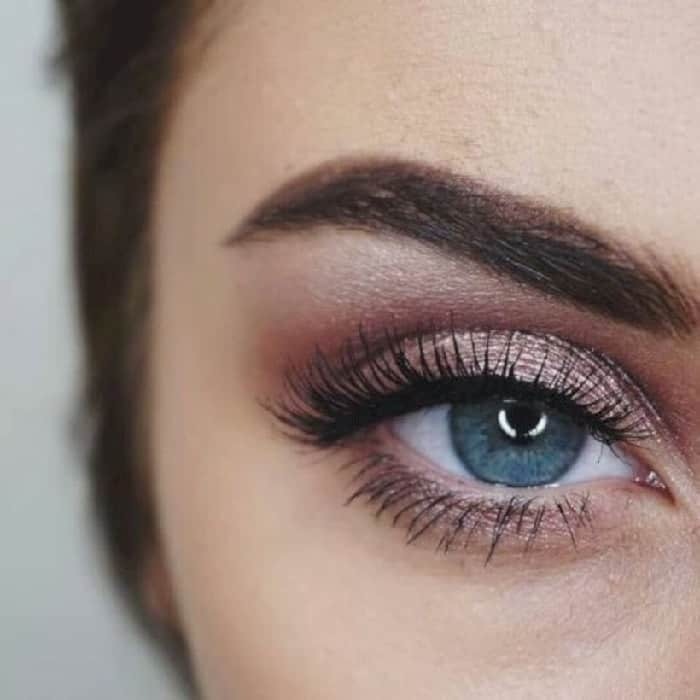 As you can see here, the contrast is intense, and the rest of your makeup will require very little effort on your part because the focus will be brought to your eyes. 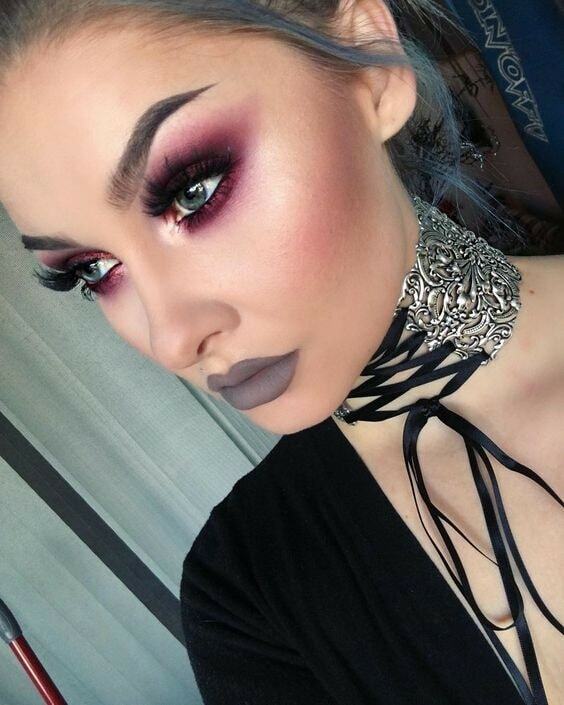 This is an evening look for the bold goth Barbie kind of girl! Unicorn looks are very popular right now, so I couldn’t end this list without giving you at least one example. 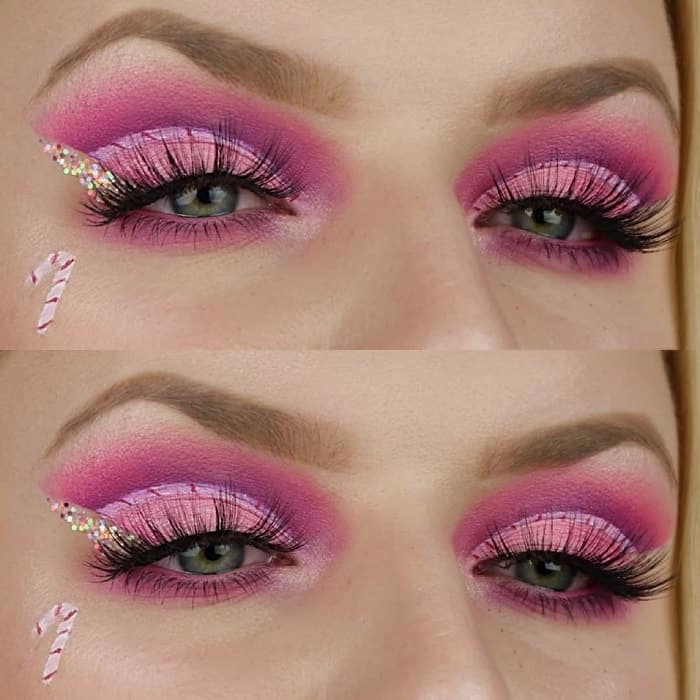 This neon unicorn look is quite intense and the bright pink makeup really brings everything together! 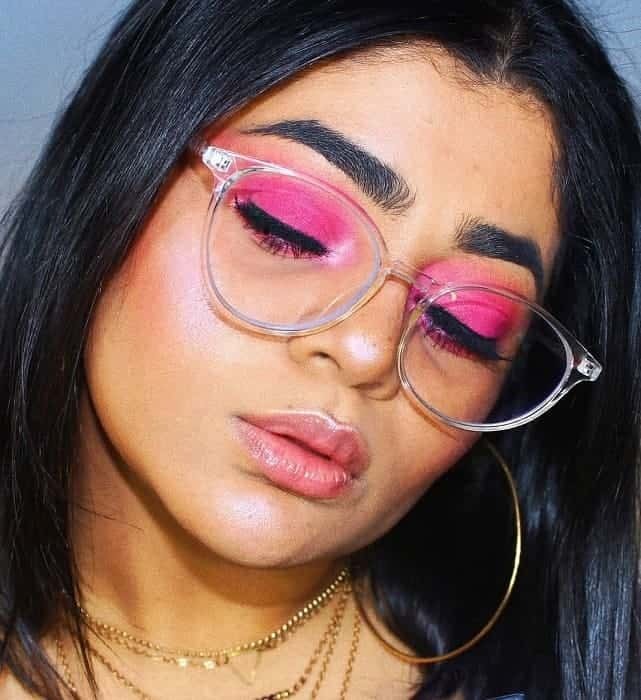 Pink is a ridiculously versatile color, as you can tell from all the examples above, and there are tons of different looks you can try with many different hues of pink. 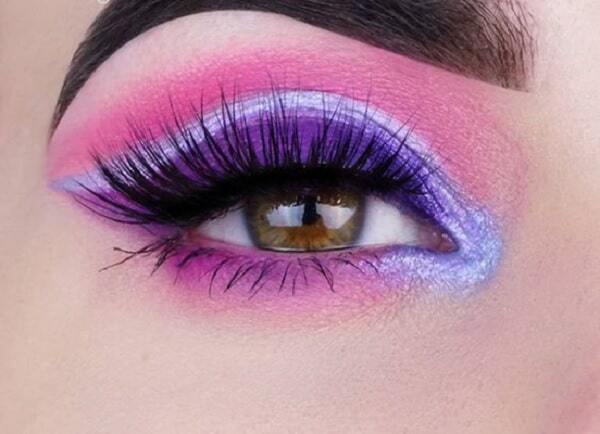 Pink eye makeup is exciting and fun, so give it a try with any of these looks!